A circle has no beginning and no end. This “circle” began with a Jewish baker but it definitely didn’t end there! I wanted to experiment more with yeast and hence, I joined Fresh from the Oven. I love the idea of having challenges set out for me. It is a great way to motivate me to bake things I would otherwise have not even considered! Just a couple days ago when my manager asked me what my plans were for the night, I said, “Oh I’m making bagels tonight”. She gave a confuzzled look. It was priceless. Then she laughed and replied, “Well, that’s the first time I’ve heard an answer like that!” Well, I gotta admit, it’s probably a little unordinary. Now that I have my new KitchenAid, I was really excited to try out my hook pedal. I haven’t made bread very often in the past but I’ve always had to knead the dough by hand. After trying out my new stand mixer, all I can say is that I don’t think I can ever go back to mixing by hand…! Measure the warm water and then stir in the oil and honey. If kneading by hand, make a well in the centre of the flour and pour the liquid in gradually, bringing the dough together with your hands. Turn the dough on to a clean, dry and floured work surface. Start kneading the dough by stretching it away with the palm of one hand and folding it back again with the other. Knead the dough for 10 minutes. You may need to add more flour as you go if the dough is too sticky. I kneaded with a mixer, slowly add the liquid to the dry ingredients with the mixer on a low speed (I use speed 2 on a kitchenaid). Knead on this slow setting for 10 minutes. 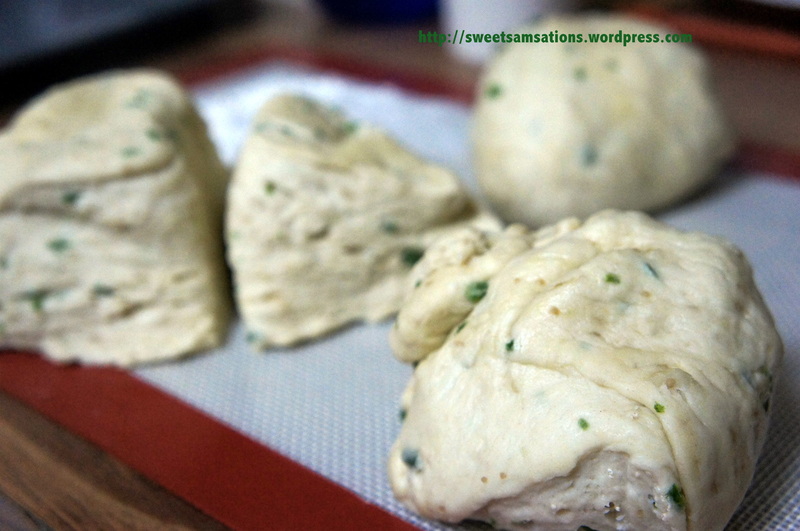 Add more flour is the dough is too wet.This dough is stiffer than normal bread dough but will still have elasticity. Place the dough in a lightly oiled large bowl and turn to coat in the oil. Cover with cling film or a plastic bag to create a draught-free environment and put in a warm place (not hot) for between 1-3 hours or until doubled in size. Lightly oil two baking trays. Remove the dough from the bowl, punch it down to knock the air out and knead briefly. 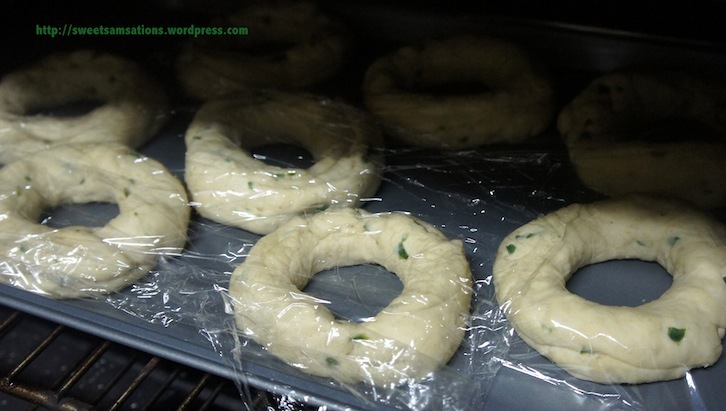 There are two ways to shape the bagels. One is to firmly roll out each chunk in to a long sausage shape, then form a ring and seal the ends together with a tiny splash of water and squeezing. The other method (my prefered method) is to roll each chunk into a ball. Piercing a hole in the centre with your finger, pull the dough open wide by twirling it round your index fingers (wider than you think you need as the hole will shrink when the dough proves, is poached and then baked).Place on the prepared baking tray and repeat with remaining dough. Cover and allow to rise for a further 10-20 minutes. Preheat the oven to 425 degrees F (400F fan). Fill a large sauce pan with boiling water (from the kettle) and return to a simmer. Gently lift each bagel into the water to poach (do not try to put too many bagels in at once as they will expand slightly). Poach for about 90 seconds on each side, turning gently with a slotted spoon. Remove the bagels from the water, allowing them to drain first and place on the prepared baking trays spacing them about 3-4cm apart. Brush with beaten egg and sprinkle with parmesan cheese. Bake in the oven for 15 minutes, then turn upside down for a further 10 minutes to cook the bases. Cool on a wire rack. Ta daaa!! 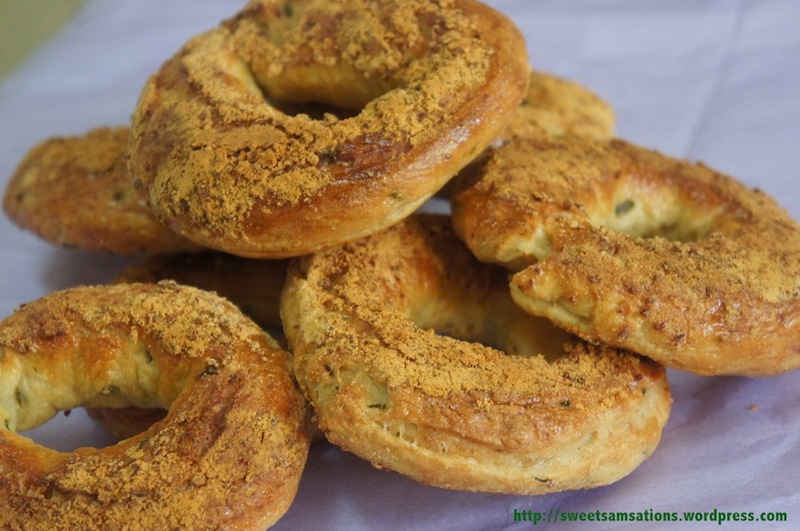 Here are my Jalapeno 3-Cheese Bagels! They definitely taste best fresh from the oven! 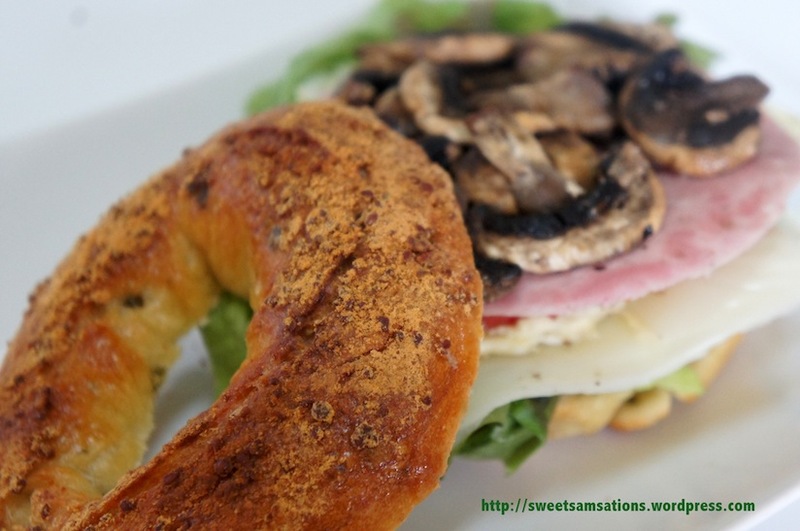 I decided to make myself a BAGELWICH for lunch! Of course I had to include cheese, mushrooms, 2 slices of ham and tomato. Very filling and scrumptious indeed! Aren’t bagels such a wonderful thing? Sam! Sam! Sam! These bagels are awesomeeeee!!! They look so delicious and flavorful. I love the addition of jalapeno for that bite and the cheese, who doesn’t love cheese? You’re tempting me badly right now! YUMMY. hehe.. Thank you Tia! Yes! Cheese does make a huge difference in anything!! I wish I had more jalapenos in though. I didn’t realize how much the jalapenos lose their spice when baked! Those bagels look amazing! I am so impressed that you baked them at home. The pictures are wonderful and I love the step by step method shown. Absolutely fantastic!!! We LOVE bagels! These sound fabulous. Yeah! I’ve been having it for lunch and dinner the past 2 days! Thanks Kay! Wow! Those look amazing! You did a really good job. I bet they taste as good as they look. 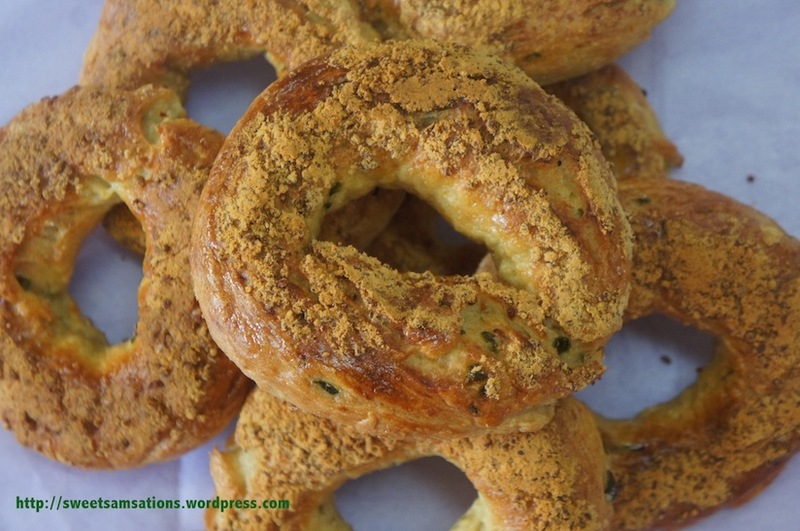 I love jalapeno/cheddar bagels from my local store but I bet these are a million times better. awww! So sweet of you! Thank you!! I must say though, cream cheese does wonders to these bagels! I’m going to join that group as well. What a great idea and it would be fun to have challenges set by others! I felt exactly the same way the first time i had bagels! I hated them! But subsequently, the array of toppings that i could place on them won me over! I know right! It’s because bagels aren’t exactly a common staple in Asian diet. I’ve almost never seen it (or perhaps failed to notice it) when I was growing up in Asia! Thank you!! I really love my spice and jalapenos add the perfect spice to baking! hehehe.. Exactly!! Bagels are almost non-existent in Asia! Thanks for visiting mine too!! Your bagels look great. Thank you for taking part in FFTO this month. Thank you very much! Great recipe!! Lovely combination of tastes – I’m going to try jalepenos next time. I love the idea of jalapeno and cheese. The parmesan on top adds such a nice finish! hahaha… Get it when it’s on sale!! I think my friends got me this one when it was on sale for $200! You won’t regret it!! 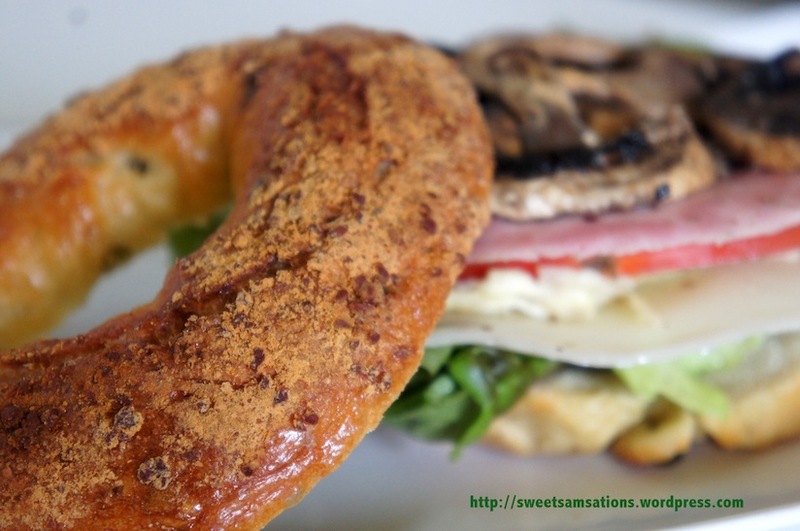 Sounds a bit like nachos in bagel form – yummy! haha.. Thanks!! mmmm!! I looove nachos! I am soooo gonna make these. 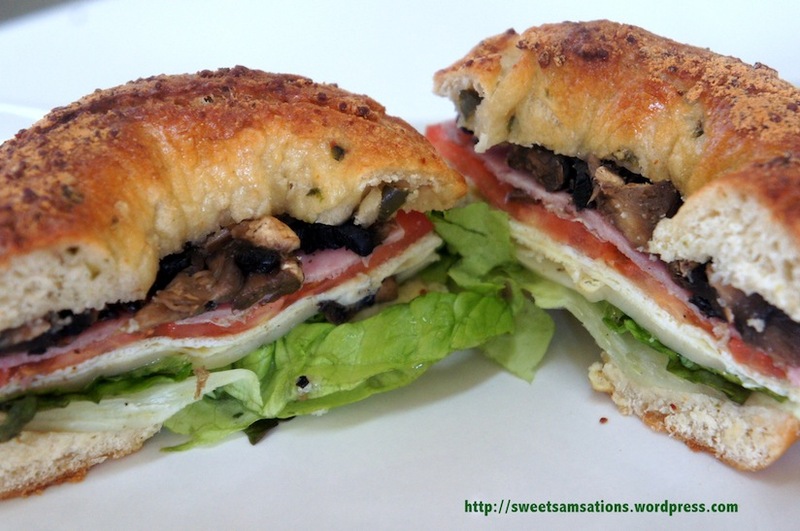 I’ve never made bagels at home, but it’s been on my list of things to try and these look perfect! seems delicious! Will try it soon! I didn’t read this post before so I’m leaving my comment here. It’s always my dream to make bread, especially french bread and bagels!!!! Awww yours look so good. When I first came to the US and attend college, I pretty much live off with bagels and mocha because I was so addicted to them. It brought my bad eating memories (well at least it’s rather healthy food? Oh well). 🙂 Thanks for sharing the recipe with us! Thank you Nami!! haha.. Yes! Bagels are definitely a college thing. Plain ones were less than a dollar each and very filling too! Oh college days!! Thanks for stopping by again!